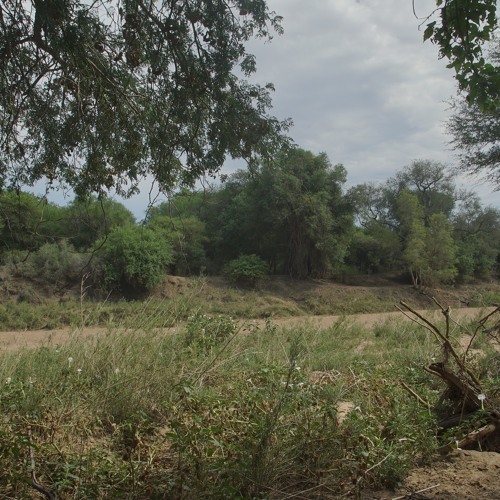 Recorded in a dry river bed on the Limpopo river at around 5.45am, about an hour after dawn, on the 28th of November, 2014. The dominant birds in this recording are a group of Natal Spurfowl's (Pternistis natalensis), other species calling include: Woodland Kingfisher (Halcyon senegalensis), African Hoopoe (Upupa africana), Red-eyed Dove (Streptopelia semitorquata), Bearded Woodpecker (Dendropicos namaquus), Tropical Boubou (Laniarius aethiopicus), Green Woodhoopoe (Phoeniculus purpureus), Egyptian Goose (Alopochen aegyptiaca), African Fish Eagle (Haliaeetus vocifer), Southern Boubou (Laniarius ferrugineus). There are quite a few other birds calling that I haven't identified yet, mainly all the tweety birds which I always find difficult to identify. Recorded at Mmabolela Reserve, Limpopo, South Africa, during the 'Sonic Mmabolela' residency organized by Francisco Lopez & James Webb, many thanks to everyone involved in the residency! And to the people who lent me money which made my involvement possible: Mum, Dad, Oma and Rachael B. @espaces-sonores: Are you trying to tell me to upload my beautiful air conditioner drones Stephane?! @900hz: Thanks Peter! This spot was particularly rich in bird life, really beautiful gallery forest there. Such a contrast to the arid savannah!